A circle is a simple, beautiful and symmetrical shape. When a circle is rotated through any angle about its centre, its orientation remains the same. When any straight line is drawn through its centre, it divides the circle into two identical semicircles. The line is known as the diameter. 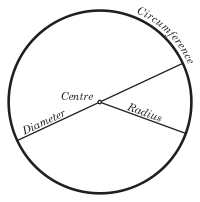 The common distance of the points of a circle from its centre is called radius. The perimeter or length of the circle is also known as the circumference. The diameter of a circle is the length of a line segment whose endpoints lie on the circle and which passes through the centre of the circle. This is the largest distance between any two points on the circle. The diameter of a circle is twice its radius. In other words, two radius make one diameter. A chord of a circle is a line segment whose two endpoints lie on the circle. The diameter, passing through the circle's centre, is the largest chord in a circle. A tangent to a circle is a straight line that touches the circle at a single point. A secant is an extended chord: a straight line cutting the circle at two points. An arc of a circle is any connected part of the circle's circumference. 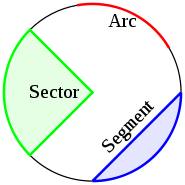 A sector is a region bounded by two radius and an arc lying between the radius. A segment is a region bounded by a chord and an arc lying between the chord's endpoints. Angles in the same segment are equal. ∠A and ∠B are equal. Property can be abbreviated as Ðs in the same segment. Angles in a semicircle = 90°. 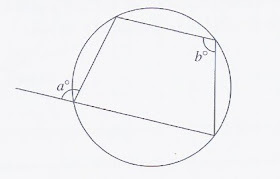 Angle at the centre = twice the angle subtended by the same arc at the circumference. 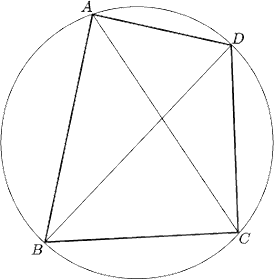 Angles in opposite segments are supplementary. b + d = 30 + 50 = 180. Property can be abbreviated as opp. Ðs of cyclic quad. Exterior angle of a cyclic quadrilateral = the interior opposite angle. Property can be abbreviated as ext.Ð of a cyclic quad. A circle is symmetrical about every diameter. 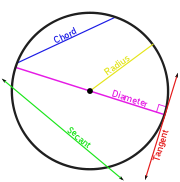 Hence any chord AB perpendicular to a diameter is bisected by the diameter. Also, any chord bisected by a diameter is perpendicular to the diameter. Given a circle, centre O and a chord, AB, with a mid-point D, we are required to show that OĈB = 90°. In equal circles or in the same circle, equal chords are equidistant from the centre. Chords which are equidistant from the centre are equal. 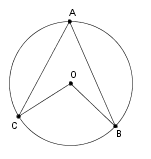 In the figure, triangle OAB is rotated through an angle AOA' to triangle OA'B' about O. Since rotation preserves shape and size, AB = A'B' and OG = OH. The alternate segment theorem states that an angle between a tangent and a chord through the point of contact is equal to the angle in the alternate segment. Thus, ÐPTB = ÐPQT.